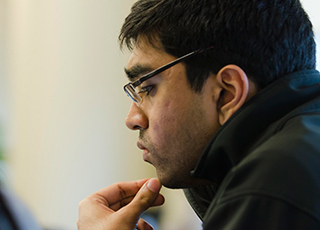 Starting around two and a half years ago, I began interacting with a young statistician, Rahul Mazumder, about synergies between research in statistics and optimization—two topics that form part of the core of operations research as a discipline. Together with Paul Grigas, a doctoral student at the ORC, the three of us started to explore a variety of issues, including connecting boosting methods in statistics to modern algorithms in optimization, using optimization tools to solve statistics problems that arise in recommender systems and other collaborative filtering methods, as well as exploring how optimization can contribute to a variety of algorithmic and statistical issues in logistic regression. It was a delight to work with an ORC doctoral student on such an interdisciplinary agenda of topics, and our collaboration has been both very productive as well as deeply satisfying at an intellectual level. What does the ORC mean to me? The Operations Research Center has always been my favorite place at MIT. Why? Because among all of the various units at MIT, only the ORC has it all: charm, wit, wisdom, and the desire to showcase the very best that operations research offers the world. The charm of the ORC stems from its staff and the great students and the great student culture. I don’t know how they do it, but year after year, the students amaze us with their intellect, stamina, humanity for one another, and their delightful approach to the faculty. The wit of the ORC is seen in the decorations and the great ORC T-shirt contest. The wisdom of the ORC is really showcased when I attend a thesis defense. Not only are the students’ theses a great intellectual testament to their talents, but it is also great to see how many fellow students attend a thesis defense to support and uphold the camaraderie of the Center. But most of all, the ORC truly showcases the can-do spirit of operations research by engendering a fearless sense of “I can solve your problem” in the students and the faculty, and shows me month after month, year after year, why I keep coming back to the MIT Operations Research Center. When I came to MIT for the first time in 1981 as a graduate student, my initial plan was simply to get a master’s degree, visit a bit the U.S., and then go back to France to work as an engineer. Research and academic careers were absolutely not even part of the thought process. Little did I know at the time! During the first six months, it became clear that I had the research bug, and that operations research was a discipline with exciting methodological research challenges to tackle and tremendous opportunities to impact society. I went on to pursue my doctoral degree, and was fortunate to have Amedeo Odoni, then a faculty member and soon to be co-director of the ORC, as my faculty advisor and mentor. That period was wonderful—the level of energy, the extremely high aspirations of faculty and fellow students, the caring staff, and, above all, the camaraderie within the ORC made my experience unique. Thirty-five years later, I continue to be in awe of the ORC, a magical and unique place within MIT, where students and faculty continuously reinvent the field of operations research, developing new methodologies and using them to impact society in so many ways. What a treat to be part of this family at MIT! My research collaboration with ORC students, both doctoral and master’s, has been the most exciting part of my career at MIT. Together, we have made journeys to many sectors, including public safety (police, fire, and ambulance), sanitation, energy management, transportation, inventory management, homeland security, and many more. Along the way, we have framed and formulated new OR models, often with accompanying new methods that generalize to other domains. These new methods have involved a variety of OR sectors, including queueing, graphs, facility location, supply chains, and optimization. A recent example is our CDC-sponsored research on modeling the progression of pandemic influenza, and showing how the changing human behavior can significantly lower the risk of becoming infected with the flu. We also derived a new way to deploy flu vaccines in the presence of a new (novel) flu virus. If this method had been used in 2009, we estimated that the 5 million Americans who became infected with the H1N1 virus would have avoided the disease. The ORC has had a special place within MIT for many decades. As an interdepartmental center, it has functioned as a focal point, bringing together faculty from different parts of MIT, with interests in optimization, stochastic models, and applications in many different domains. It has attracted a steady stream of outstanding students who have gone off to successful careers, and with whom it has been a pleasure to interact. Personally, I have very much enjoyed research on queueing networks and other stochastic models, as well as the opportunity to co-supervise students from different departments.